Our Charlottesville Area Association of Realtors has just released the latest real estate market report showing stats for sales in our area, 2018 1st Quarter. • Home sales climbed 13.7% (691) compared to Q1 2017 (608), led by an increase (28.3%) in attached homes. 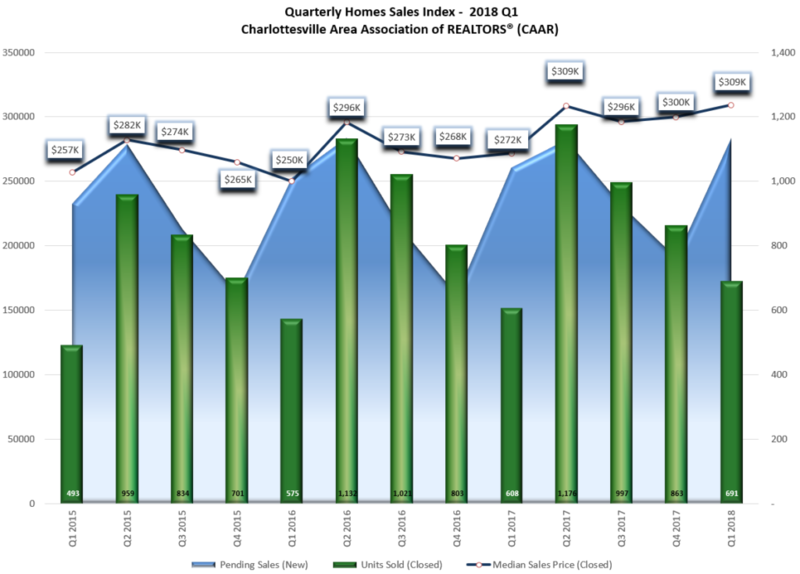 • Greater Charlottesville median sales price rose to $309,145 (13.8%) compared to this time last year ($271,629). • The median days on the market in the 1st Quarter was 70, 11-days lower than in Q1 2017. • Pending sales increased 8.8% (1,134) compared to this time last year (1,042), as new listings declined slightly (1.7%).